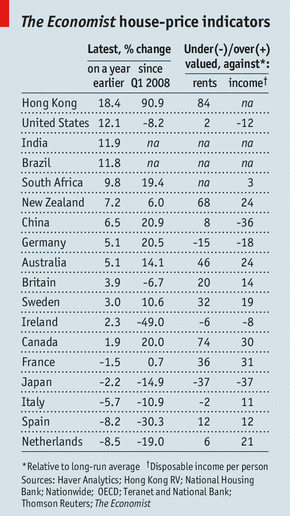 A few days ago, The Economist published its latest house-price indicators and the picture is not pretty. Canadian housing is overvalued by 74% against rents and by 30% against incomes as compared to the long term averages. 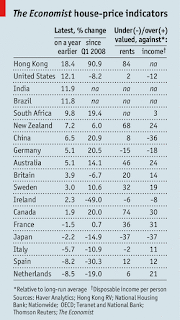 Furthermore, The Economist calls Canada's house prices bubbly. 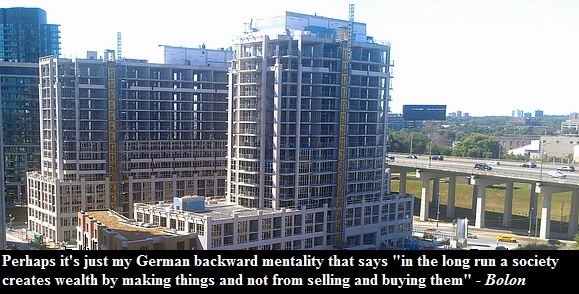 But what would a British magazine know about the Canadian real estate market? Does it even have a right to call it a bubble? Well, in a way The Economist has more credibility than Flaherty, Poloz or your local real estate agent. As early as 2002 The Economist pinpointed housing bubbles in the Netherlands, Ireland, Spain, United States and Britain. Today 20% of real estate in the Netherlands is underwater, prices in Ireland and Spain have crashed by about 50%, and home prices in the US and Britain are down by over 25%. In 2005 The Economist called the worldwide rise in house prices the "biggest bubble in history". Back then American real estate prices were overvalued against rents by 35%.